For many years, the Magento ecommerce platform has been the retail industry go-to for running an enterprise online store. However, when most businesses first choose Magento, it was the only viable option out there. 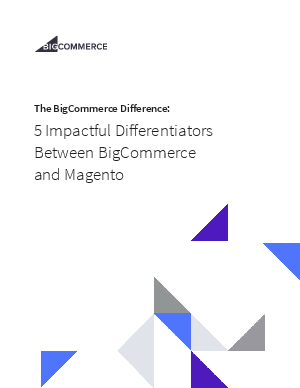 Today, Magento is no longer the only option for mid-market and enterprise businesses. SaaS platforms like BigCommerce have disrupted this market, allowing for deep customization, unlimited products, industry-leading average uptime of 99.99%, 24/7 support, one-click application integration, and seamless product updates. All for a fraction of the cost. Learn the five more critical differences between the two leading platforms in this white paper.